It’s still dark outside when Simon deftly eases the PistenBully grooming machine out of the garage bay door and onto the snow-covered Aspen Golf Course. The landscape, so familiar during daylight hours, is disorienting at night to the uninitiated. Immediately, Simon adjusts the multi-function control stick in his right hand and begins rolling a new layer of corduroy over the multitude of diagonal gouges scratched into the snowpack by the prior day’s Nordic skiers. After checking his work in the rear window, he re-adjusts to ensure the grooming machine is erasing the scuffed-up surface, combing it into a smooth ribbon of rolled snow. We’re moving at speed 6 on a machine with speed settings of 1 (are we moving?) to 9 (slow). The snow and shadows gleaming in the headlights provide a contrast that makes grooming easier from a visual standpoint than it is in the flat light that often materializes at daybreak. And, the early groom gives the snow time to set up before skiers arrive to carve it up again. How much of the 60 or so miles of Nordic trails in the Aspen-Snowmass system is groomed on a given day depends on weather conditions, pending events or competitions that necessitate a fresh groom on part of the system, and available manpower on a given day. Typically, three or four individuals head out in the pre-dawn darkness throughout the heart of winter to make sure the golf course, a.k.a. the Aspen Nordic Center, the Aspen High School trails and Snowmass Golf Course trails are in tip-top shape. These areas are the most heavily used by skiers. The Owl Creek Trail, Marolt Open Space and Moore Open Space are generally in the next tier of priorities, seeing a fresh groom every other day unless new snow is piling up and demanding daily manicuring. 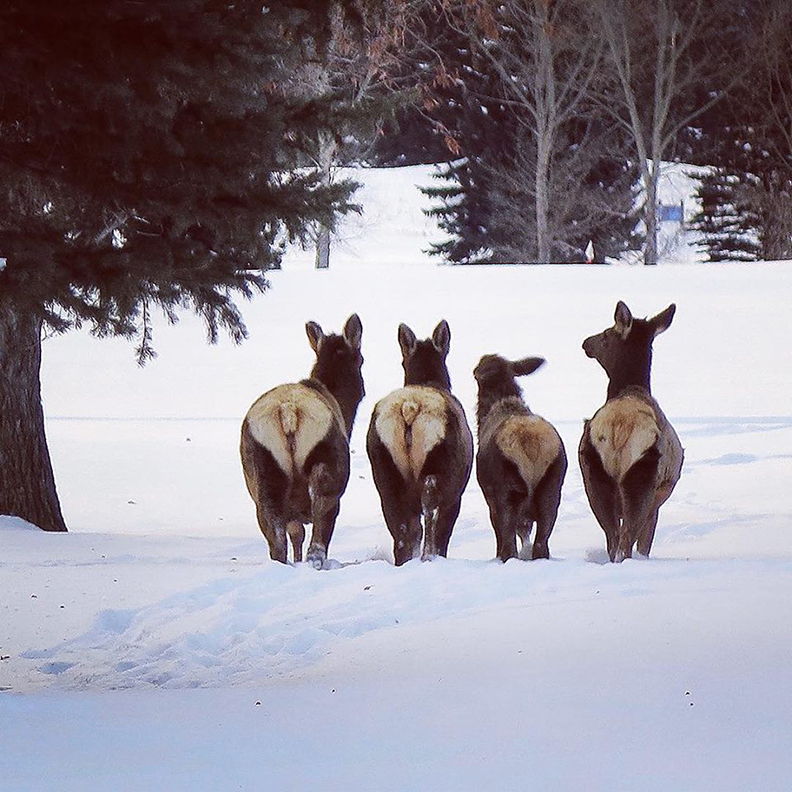 North Star Nature Preserve, where equipment needs to be transported to the site in order to groom the loop, generally sees a touch-up every other day and may wait a day after it snows before it sees a new groom. The Rio Grande Trail, which sees quite a bit of sun exposure along much of its length, and where it is most difficult to maintain a snowpack, gets a lighter touch by the crew. While it also sees foot traffic, generating the need for a fresh groom more often, the snow on the Rio tends to degrade quickly, so the crew resists grooming it too frequently. 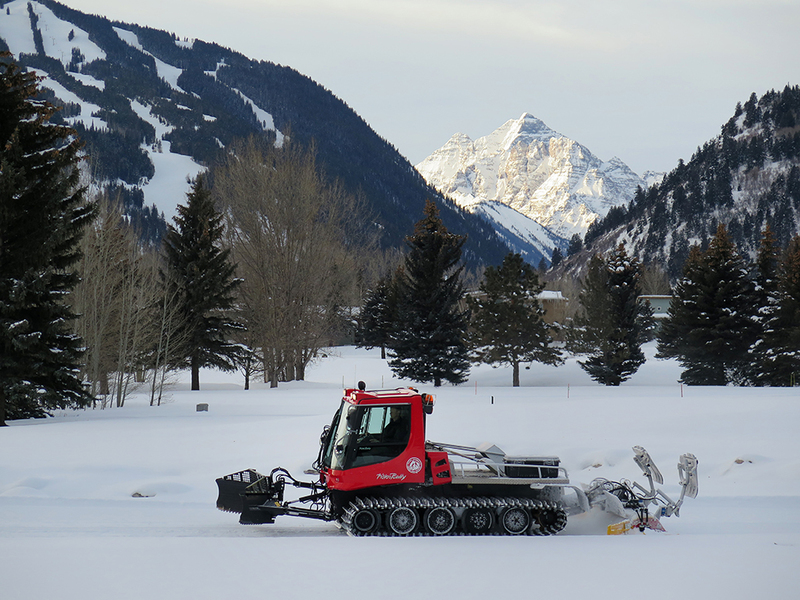 Bountiful snowfall and cold temperatures give the Rio Grande a boost on the grooming schedule. 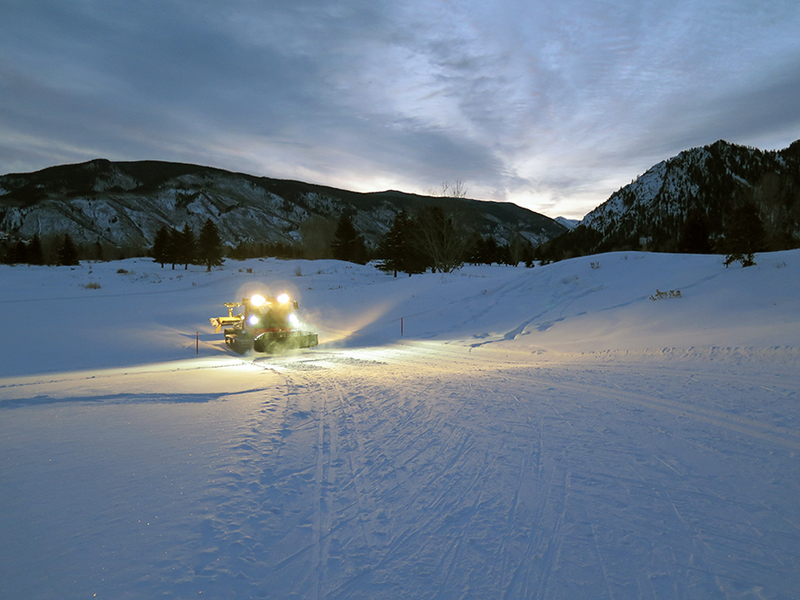 The trail is groomed from Aspen to the county border at Emma by the Aspen-Snowmass crew. When it snows, members of the grooming team may be out for 8 or 9 hours guiding one of the program’s three PistenBully machines or the smaller pieces of equipment at their disposal. For Simon, those are long days of listening to music and podcasts while making the rounds at a snail’s pace. It’s not possible to groom 60 miles of trail quickly when you’re moving at a top speed of maybe 5 mph. Even on this day, when no fresh snow has fallen overnight, the teaching loop at the golf course requires four passes – two to reset the ample corduroy, one to wipe away the classic track and then one to reset the two parallel sets of classic track. Sometimes, erasing the old classic track and setting the new tracks can be done with one pass, but Simon opts for the two-step process this time. We repeat it all over the golf course. Come spring, when a freeze-thaw cycle softens the snow during the day and makes it rock-hard at night, grooming waits until mid-morning, when the snow softens up enough to roll new corduroy and fresh classic track. Nordic grooming is a bit of an art form. It’s not as easy as it looks. At the golf course, each groomer has a system. The goal: groom all of the trails efficiently, without backtracking. Oh, and make it perfect. If there’s a wiggle in the classic track, everyone will notice. The Nordic crew is employed by Aspen Parks and Open Space, but funding for all costs associated with the Aspen-Snowmass Nordic System comes from the Pitkin County Open Space and Trails program – a budgeted expense of about $335,000 for 2019. As a result, the Aspen-Snowmass system operates without a fee to skiers, unlike the Nordic centers at many Colorado resort towns. Anyone can jump onto the Aspen-Snowmass trails anywhere, free of charge.